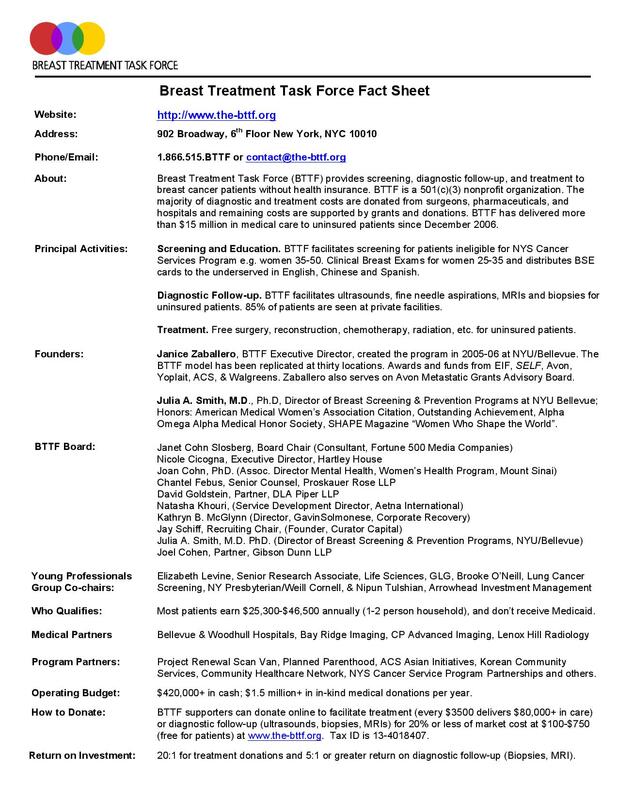 Breast Treatment Task Force (BTTF) is a grassroots organization that facilitates free breast screening and education, diagnostic follow-up, and treatment for NYC patients without health insurance. The average BTTF patient earns $30,000 annually, does not receive health benefits from her employer and cannot afford to pay $300 per month for an individual healthcare plan. Most diagnostic and treatment patients assisted through BTTF would otherwise experience large medical debts or bankruptcy. BTTF Programs began in late 2006 with the organization’s founding medical partner, Bellevue Hospital. BTTF programs expanded to Woodhull Hospital, Union Square Imaging Center, Bay Ridge Medical Imaging, and CP Medical Imaging. Each medical partner agrees to assist uninsured patients at the lowest possible rates, which BTTF pays to each institution. BTTF services are always free to patients. 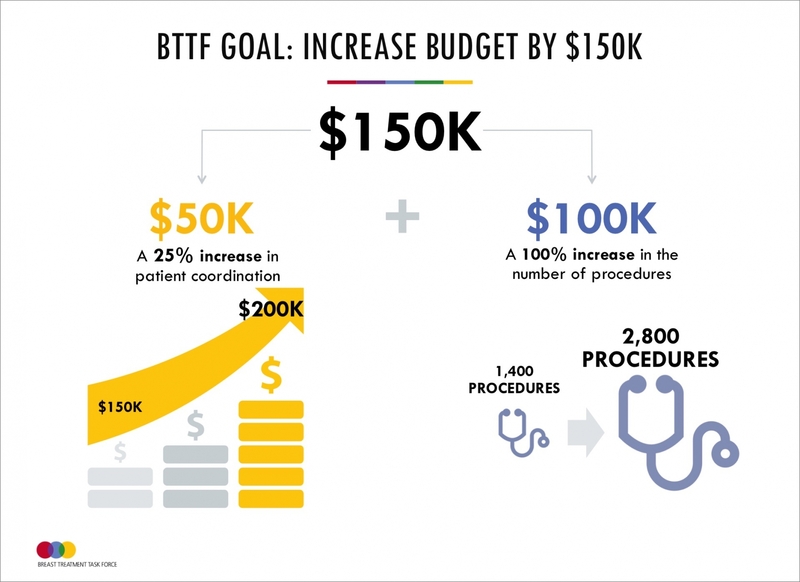 BTTF has facilitated more than $17 million in medical care for hundreds of uninsured patients since the program’s inception in December 2006. See return on investment for each program. BTTF does not directly reimburse patients for medical expenses or issue funds to patients (for rent, living expenses, etc.). Please consult the fact sheet below for a brief overview of BTTF’s work. Click on the image to enlarge. Referrals to BTTF occur when community organizations screen uninsured low-mid income women, but cannot provide diagnostics such as sonograms, MRIs, biopsies, or cancer treatment. Enrollment. One-third of the estimated 1 million New Yorkers currently uninsured earn $28,000-$46,000 annually. This is the population BTTF serves. Eligibility. Although the ACA ensures women ages 40-49 can receive mammograms every other year at no cost, 80% of BTTF patients in need of preventative screenings are between the ages of 26-40, and are therefore ineligible for a government-subsidized screening. Affordability. Diagnostic services such as sonograms, MRIs and biopsies are considered non-preventative and for newly insured women, and remain prohibitively expensive with hundreds and thousands of dollars in out-of-pocket costs. Almost all patients with abnormal mammograms need sonograms; 30% of BTTF patients require biopsies or MRIs. To learn more about health care for BTTF patients after the implementation of the Affordable Care Act, click here.